Here are the resources I showed and referred to in my Club Officer Training for the office of Secretary. If you have any questions or suggestions, please contact me at kelley nnn nospam at gmail dot com. To find Club Central, log in at the Toastmasters International site, click the Menu button in the upper left hand corner, click “Leadership Central” in the drop down menu, then click on “Club Central” in the submenu. From there, you will be able to access your club’s administration page. You will also want to look at “Club Officer Tools”. There you will find resources such as an electronic copy of the Club Officer Handbook, and information about the Distinguished Club Program and Club Success Plan. To submit your club’s updated Officer list, go to http://www.toastmasters.org/clubbusiness. What the Heck Is a Kernel? I attempt to answer that question, for the sake of the layperson, in this Toastmasters speech I gave this afternoon. My evaluations and feedback were overwhelmingly positive. I got a lot of praise not for just making this topic accessible, but for even trying in the first place. The audience liked my analogies and my jokes. Although my positioning on the stage is sometimes lacking, I was told today that I stood in the perfect place. Glad I finally found my clicker last night, or I’d have had to stand right by my laptop. My evaluator had some good points about my examples. Yes, the modem is very outdated, and I knew it. I’d started out intending to describe what historically came next, but then lost sight of that, leaving the inappropriate example still there. Also, he zeroed in on the word I was grasping for: “multitasking.” It’s amazing how what we think we know deserts us at times. It feels good to get out of my loop and connect with other Toastmasters like this. Thanks, Cadence AHgorithms, for welcoming me. After all the intensity of the past four months, I’ve now gotten the payoff, in a big way. First, my swapoff project is finally working correctly, and can be considered tentatively complete. I’ll be meeting my mentor face to face at the Linux Collaboration Summit tomorrow, and he’ll be introducing me to some other Linux and mm folks. We’ll sit down together and walk through the code, looking for ways to improve it. Plus, of course, a piece of software is never complete, it keeps evolving throughout its useful life. Still, I can now count this as a finished project. 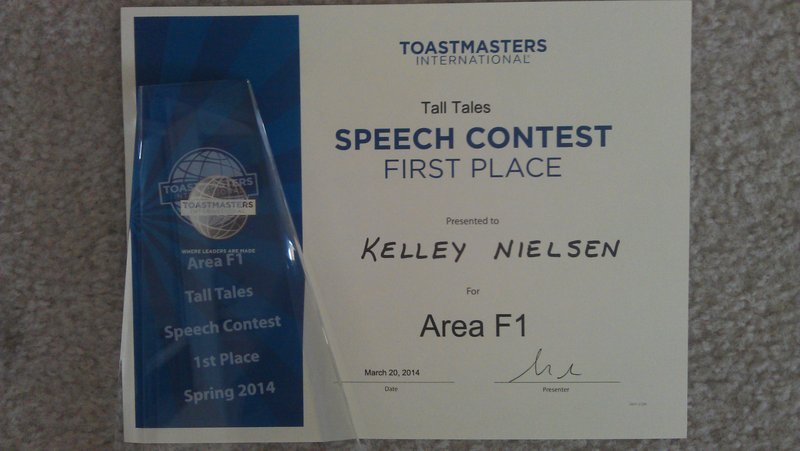 Second, I competed in another Toastmasters Area contest, and this time I won First Place. I’ve won Second twice, and have now graduated to the Division stage. One club elder who has been a big help to me says that if the club can be compared to elementary school, this is like a junior high graduation, and I’m ready to go on to high school. Thanks so much to everyone who helped me, in both areas. I’m keeping names private; you know who you are. You rock.